Thanks to @DeMarcoDraws for this art piece! At the request of two powerful crime bosses and the assistance of allies affected by the harm caused by the Iron Shepherds, the Mighty Nein entered the final chamber of the Sour Nest to rescue their kidnapped party members, avenge the fallen, and prove that they could accomplish this relatively little good in pursuit of their greater purposes. Two core members of the Shepherds had already been picked off, and all but a single rather inconsequential common guard were killed in the assault. In this final room, the Mighty Nein faced off again Protto the rogue, Ruzza the bard, and Lorenzo… the oni. Keg first described Protto as a “s***ty little halfling rogue.” His performance in this battle did not disprove this. Protto got his crossbow out, won initiative, and then did very little with that advantage. He managed to hit the Nein’s rogue once for all of four damage in the fray. After that, he had the party bruisers in his face distracting him while Nott got a couple of Tinkertop Boltblaster 1000 sneak attack shots in that dealt real damage. After making two ineffectual shortsword strikes against Keg, Protto met his demise at the fists of Beau. Ruzza opened the battle by trading spells with Caduceus (Confusion vs. Blindness/Deafness and Spirit Guardians). Neither incapacitated the other beyond holding each other’s attention for the opening round, but Ruzza did not receive the support that Caduceus did thereafter. Once Protto was dead, Keg set her sights on Ruzza. Ruzza, realizing that her only compatriot was her boss, went for a defensive spell, Hold Person. Unfortunately for her, Nott was looking out for her teammates, and fired a shot that made her lose concentration on the spell before Beau’s next turn was up. That said, Ruzza would have lost concentration on the spell, anyway, because Nott’s bonus action bolt killed her. This battle also would have gone down very differently had Dwelma, the druid, or Wohn, the barbarian, been present. Without the dual physical threat of a barbarian to split the difference and give Protto sneak attack, or the disruptive magic of the druid, the Shepherds were much less threatening than they had been on the open road. It's interesting to note that at no point did Ruzza or Protto demonstrate that they felt like they had the upper hand, despite having the home court advantage. Ruzza's (unused) inspiration to Lorenzo lacked a certain amount of team morale, and both her and Protto showed far more fear and surprise upon running directly into party members than the confident, threatening nature of their boss. In their defense, they weren't used to their victims being able to actually retaliate, and they couldn't just disappear like Lorenzo. Thanks to @luseals for this art piece! As Caduceus recalled after the battle, an Oni is a form of giant distantly related to ogres. They are superior in all ways to their distant cousins: smarter, wiser, more charismatic, magic-wielding, and even their weapons are vastly more dangerous. Oni are largely self-employed, looking after their own best interests. In their case, their best interest is finding their next humanoid meal. However, an oni will willingly work for someone if the price is right: luxurious living, magical items, protection. Volo’s Guide to Monsters lists oni among the potential Brutes that a hag will employ to patrol her grounds, or harass anyone who would aim to hurt her. Lorenzo has been living a comfortable life, as far as oni go. The Jagentoths pay for him to have a stronghold with his own bedroom, surrounded by lackeys that are fairly powerful in their own right, and all he has to do is run a successful humanoid trafficking ring… which allows him to feast on those who are too young or weak to be sold, and entertain himself with some torture on the side. "Oh, little girl, you're making crafting this nightmare too easy." Thanks to @glossyjpeg for this art piece! Lorenzo had been following the party since before they even entered the building, as soon as Beau's firecrackers went off outside. His at-will invisibility, combined with his natural flying speed, ensured he made no noise as he followed them around, monitoring their every move, getting into their heads, and waiting for his allies to get in a position to support his unexpected strike. This opportunity came once Protto, Ruzza, and another Sour Nest guard were able to lure the party into the dead-end basement of the Sour Nest. The party opted for the Snowball Method of enemy removal, concentrating most of their power on the guard and Protto, then Ruzza, before letting Lorenzo have it all at once, only giving the other remaining living antagonist about 18 more seconds to do his worst. Beau easily took the title of MVP this battle. She single-handedly took down yet another unnamed Sour Nest guard in a single round. By staying in melee range of Protto after dealing her damage, she assisted Nott in getting sneak attack damage on him, allowing Beau to take him down as well. Despite falling prey to Hold Person and going unconscious, Beau still managed to deal 55 damage to Lorenzo. And that’s not even mentioning her fifth round stunning strike, which we’ll go into shortly. Lorenzo’s obsession with eye for an eye and responding to insult in kind was an exploitable strategy. Caleb’s decision to focus fire on Lorenzo (a surprise attack with his own invisibility coming to an end) prevented Beau from taking another series of glaive strikes from the oni. Although Lorenzo quickly retaliated and reduced Caleb to 2 HP, it should be noted that this 29 damage did not go to anyone else, nor did it ever fully limit Caleb’s ability to contribute to the battle (outside of having to spend most of it outside the central battle area). Wizards can tank sometimes, too. In round 3, Lorenzo wised up to the fall of his remaining allies, and escaped to the cover of invisibility. He was still regenerating 10 HP every round, had a weapon that granted him attacks of opportunity from ten feet away, and could turn invisible and fly out of reach at will every round, provided he had the opportunity to do so. While the party struggled with his disappearance, he took advantage of their confusion to get into position to use his single-use-per-day Cone of Cold. With two opposing party members taken out by this spell attack, three more severely wounded, Nott doing her best to stay hidden, and the rest of the party tortured and locked away, Lorenzo had every right to be cocky. This same cockiness came back to turn the entire battle against him in less than two short rounds. At the point Lorenzo made his last decision, Beau and Shakaste were both unconscious. Even had she been awake, from a meta standpoint, Beau's Stunning Strike has not had an impressive record against even the most common of foes (50%, 5 successes out of 10 attempts). Matt mentioned in-game that Lorenzo had a +6 bonus to constitution saves, so her stunning strike only had a 35% chance of succeeding. But the risk paid off: Lorenzo’s hubris following his successful Cone of Cold distracted him from flying out of Beau's range. After a clutch turn during which Caduceus displayed the full power of a Grave Domain cleric in dire situations, Beau was able to get up and pummel Lorenzo, who failed to resist the stunning strike. 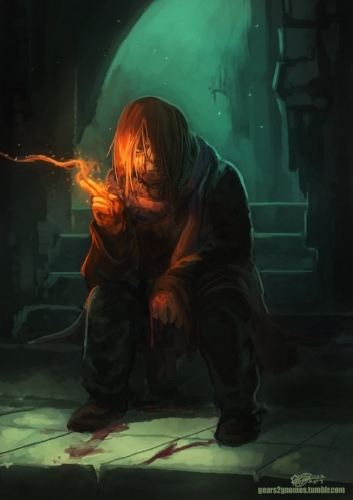 Caleb, raggedly hiding in the stairwell, finished Lorenzo the same way he began the encounter: with fire. From the time of the stun to his demise, Lorenzo took 101 of his total 176 damage. Thanks to @gears2gnomes for this art piece! Matt explained after the episode that had Lorenzo had the opportunity to act (i.e., had Caleb not ended the encounter right then and there), he would have turned invisible and waited for his health to regenerate before either striking again against the weakened party, or fleeing to return with backup. While we can appreciate the frustration of a major villain not living their malice to the fullest, for the sake of The Mighty Nein, this vastly simplifies the terms of their contract with Ophelia Mardun, as well as the so-called law enforcement of Shadycreek. This all went down in the middle of the night, fairly far from Shadycreek Run proper. The Mighty Nein have a 2 hour walk ahead of them to either the Mardun stronghold, the Estate Sybaritic, or to The Landlocked Lady in Shadycreek Run. Most importantly, though, is that The Mighty Nein’s personal mission was successful: freeing Jester, Fjord, and Yasha, and vengeance for Mollymauk. For those who are interested in putting Lorenzo or another oni in their game, D&D Beyond also has tips on effectively running the oni as a nightmare, written by Tal’Dorei Campaign Guide co-author James Haeck.